Implement ISO 27001 yourself, and do it easily and efficiently with our Documentation Toolkit. Our ISO 27001 expert will meet with you regularly – he will tell you where to start, what the next steps are, and how to resolve any issues you may face. You can meet via Skype, over the telephone, or through any other means at your convenience. Our team includes some of the most experienced auditors, trainers and consultants for the ISO 27001 standard. In addition, we pride ourselves on the communication skills of our expert team, which helps us to establish stable and personal relationships with our clients. It is much easier to structure our ISO 27001 documentation around a set of templates than if we had to start from scratch. I purchased the Tool Kit with your class. What you have done is a blessing for us individual company Internal Auditors! The Toolkit will allow me to complete in 4-weeks what may have taken 12-weeks without the Toolkit. Thank you!!! Acceptable for ISO 27001 certification audit? – All documents required by ISO/IEC 27001 2013 revision are included, plus other optional policies and procedures that are most commonly used. Look at EVERY template in the ISO 27001 Documentation Toolkit – for free! – before making a purchase decision. The Toolkit is available in English, German, Dutch, Spanish, Portuguese and Croatian, and includes the following ISO 27001 templates: Procedure for Control of Documents, Information Security Policy, ISMS Scope Document, Risk Assessment Methodology, Risk Assessment Matrix, Security Risk Assessment template, Risk Treatment Plan, Statement of Applicability, Incident Management Policy, Acceptable Use Policy template, Network Security Policy template, Access Control Policy template, Backup Policy, and many others – click here to see the full list of ISO 27001 documents. 27001Academy is renowned for the accuracy and quality of our products and services. This means you can be certain that each template in our toolkit was developed and reviewed by leading experts in ISO 27001. Our documentation templates were designed specifically to take the stress and worry out of your implementation project. 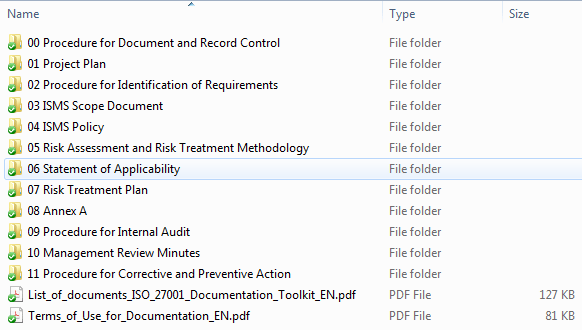 Our documentation toolkit includes templates for every single document you need to comply with ISO 27001 – all fully acceptable for certification audit. The Toolkit contains other optional policy and procedure templates that are most commonly used for ISO 27001 Annex A controls – a list of documents is also included, which clearly marks each document as mandatory or optional, and can be used as an ISO 27001 checklist. When you purchase the Toolkit you’ll get 1 year of free access to all video tutorials and webinars on demand. This way you will not only learn about the basics of ISO 27001, but also get a guided tour on how the documents are to be filled in. We take the questions and worry out of implementing ISO 27001, so you always know that documents are complete and accurate. The ISO 27001 & ISO 22301 Toolkit was developed especially for small to mid-sized businesses to minimize the time and costs of implementation. Our toolkit doesn’t require completion of every document that a large world-wide corporation needs. Instead, it includes only those documents YOUR business needs. We understood your needs, found the answers to your questions, and developed ISO 27001 Toolkit especially for your company. Our toolkit doesn’t require completion of every document that a large world-wide corporation needs. Instead, it includes only those documents YOUR business needs. Can you really implement ISO 27001 by yourself?